The Feast Nearby: How I Lost my Job, Buried a Marriage, and Found My Way by Keeping Chickens, Foraging, Preserving, Bartering, and Eating Locally (All on Forty Dollars a Week), by Robin Mather, Berkeley, CA: Ten Speed Press, 2011. Cook the Book host Debra of Eliot's Eats selected this collection of essays which relates how the author kept calm and carried on -beautifully- after an earthquake shift in her life. In one week her longtime husband announced that he wanted a divorce and she was laid off by the newspaper where she was a veteran food journalist. 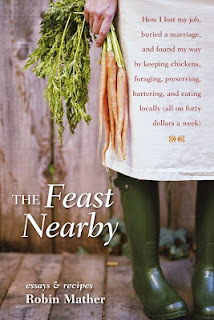 The book is stuffed with good information on raising chickens, bartering (she swapped homegrown vegetables from her neighbor for a snug, handknit hat), grocery shopping locally, preserving and canning, roasting and grinding your own coffee. I learned a lot and enjoyed her down-to-earth writing and recipes. There's a lot of richness in living and eating cheaply, seasonally and well. Each essay has a recipe finale. There are great frugal recipes featuring lots of variations of rice and beans. Some are simple standards, but others are unusual and tempting, like Mujadara (rice and lentils perfumed with cumin and parsley), Oxtail Stew, and Fassoulia (green beans stewed with lamb shanks and tomatoes). Mather is a Michigander and relates one chapter about using the local bounty of cherries. I had never experimented with dried cherries before and they were really tasty. They are a bit expensive, like most dried fruit other than raisins, and I had to hide them away from the old man (and myself) after too much errant grazing so I would have enough for Mather's recipe for Peppery Cherry Spoon Bread. You can find a copy of that recipe at this link, which also contains an interview with Mather. I am not a huge fan of Spoon Bread, as I find it a bit too moist and this version was sort of the same as my past experience, so I think next time I would just make up the recipe as a cheesy, dried cherry-studded polenta and forget the final step of mixing in the beaten eggs and baking it. But this side dish was very happy on our dinner plate snuggling up next to some sauteed mixed veggies, baked fish and some yellow rice. Next up for our book club is this sweet read: Sarah-Kate Lynch's "The Wedding Bees". Submissions are due August 3, 2015. Anyone can join in the fun. All you need to do is read the book, cook up something inspired by your reading and blog it up.